As romantic as it sounds, we know our eyes aren't actually the windows to our soul. But as it turns out, they can be windows to our health. Whether your eyes are irritated and bloodshot, or other tiny changes are happening that aren't readily apparent, taking a peek at your peepers can provide a wealth of health info, from diabetes to high blood pressure to sun damage. Of course, no one's saying it's a good idea to play eye doctor at home. Optometrists and ophthalmologists are big proponents of keeping up regular eye exams. And you should see a doctor right away if you notice any sudden or major vision changes. In the meantime, read up on these nine surprising conditions that a thorough look in the mirror may reveal. 1. You strained your eyes. Irritated, bloodshot eyes are telltale sign of eye strain. Whether you’ve been wearing your contacts too long or squinting at a screen all day, overuse typically presents with redness, dryness, and discomfort, says Carl Jacobsen, O.D., chief of the ocular disease clinic at University of California Berkeley School of Optometry. Lubricating or rewetting drops can help. “Allowing your eye muscles to rest and your corneas, which are the front ‘window’ of your eye, to rehydrate may make your eyes feel more comfortable,” says Patsy Harvey, O.D., M.P.H., clinical professor at the University of California Berkeley School of Optometry. If you wear contacts, make sure to give your eyes a break anytime you experience discomfort, redness, or dryness. 2. You have a condition affecting your blood vessels. In other words, your eye doc might be able to detect changes and catch issues, such as high blood pressure, risk of stroke, or plaque buildup in your arteries, earlier than your primary care physician might. And this isn’t something you want to let slip under the radar—these changes in the retinal blood vessels can eventually lead to blindness if left untreated. 3. You're suffering from allergies. If you’ve ever seen a commercial for allergy meds, you know that itchy, watery, red eyes are common allergy indicators. And usually a little redness is nothing serious—it can even be a totally normal side effect of the flu shot. Irritation caused by allergies, however, might only appear in one eye, where as the redness and puffiness that’s caused by a cold will likely present in both, Harris says. 4. You're stressed out—or sensitive to caffeine. The annoying eyelid twitch you get from time to time (referred to as myokymia by docs) likely signals fatigue, stress, or a sensitivity to caffeine. First, cut back on the coffee to see if it resolves. If it's stress, we know it's easier said than done, but try to reduce it—here are 40 ways to relax to help you get started. And if you're not sleeping well, try one of these 27 ways to sleep better tonight. In rare cases, a twitchy eye could be an indication of a more serious neurological or muscle condition, like a blepharospasm, a gradually increasing tick in both lids that can intensify over time and cause temporary blindness, or a hemifacial spasm, which involves an entire side of your face and is usually caused by the compression of a facial nerve. If you’re well rested and un-caffeinated, or see any of the previous characteristics with your twitch, see your eye doctor. 5. You could have neurological issues. 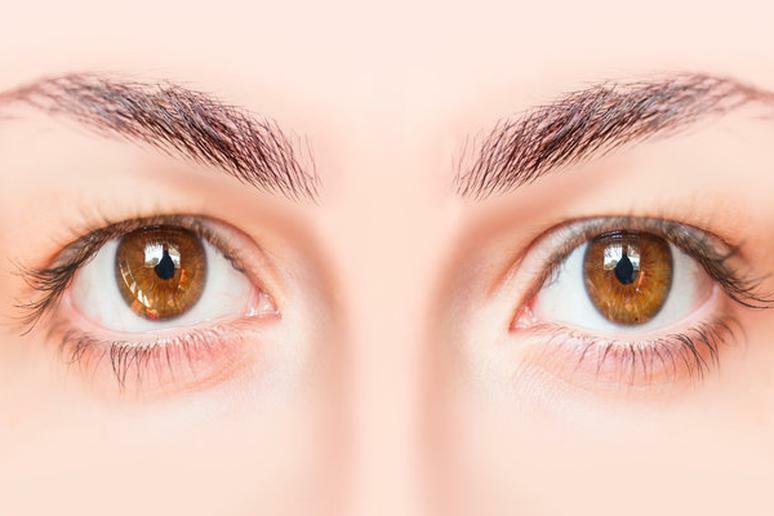 Changes in the anatomy of your eyes can shed light onto a whole host of neurological issues. If your pupils fail to react normally to light (e.g. if they stay dilated after you walk out of a movie theater on a sunny day), you have difficulty moving your eyes from side to side or up and down without turning your head, or if you see flashing lights or see double in one or both eyes, it could indicate anything from multiple sclerosis to a migraine. Different-size pupils, known as anisocoria, could also be a sign of a serious condition, such as a tumor or an aneurysm. This is why it's so important to keep up those annual eye doc visits to have everything checked out. 6. You could have high cholesterol. Your eating habits can also affect the way your eyes look. If you notice a whitish arc or ring around the iris (the colored part of your eye), it could be a signal of high cholesterol. The white hue of arcus senilis is caused by a fatty lipid deposit in the edges of the cornea—the result of elevated cholesterol levels. 7. You could have diabetes. Although not visible to the naked eye, certain changes in your retina and the blood vessels in your eye can tip off your doc to the presence of diabetes. They’ll be able to spot the presence of plaque in the retina and small hemorrhages in the retinal capillaries of people with the disease. 8. You're just getting older (as are we all!). Discomfort can also clue you in to the fact that your eyes are simply getting old. “As you get older, your eyes get dryer, and you don’t produce as many tears,” says Jacobsen of an effect that’s especially common in women as they age. If you notice a lot of dryness, it might be time to switch from contacts to glasses, since contacts can further irritate dry eyes. 9. You've spent too much time in the sun. Finally, one not-so-great side effect of living a long, active life: The eyes also serve as a clue into the cumulative sun damage inflicted on your body over the years, Perez says. Eye doctors can see sun damage manifested as pterygium (a condition also known as "surfer's eye," since it affects people exposed to the sun for long periods of time without sun protection), cataracts, and macular degeneration, as well as eyelid cancers and crow's feet. The bottom line: Always, always, always protect those peepers with proper eyewear and plenty of sunscreen year-round.